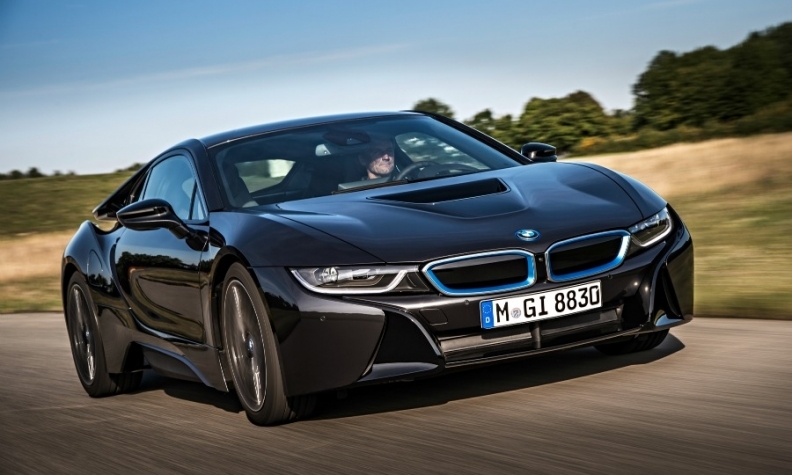 BMW says it will offer laser headlights as an option for its i8 plug-in hybrid coupe. BMW and Audi both plan to introduce laser headlamps this year, as the new technology is poised to challenge LEDs as the industry's showcase high-tech lighting. BMW Group has announced plans to feature laser high beams later this year as optional equipment in its i8 plug-in hybrid coupe, while Audi plans to present the Sport Quattro concept, which has laser high-beam headlamps, this week at the International CES, the consumer electronics trade show in Las Vegas. Audi boasts that its high beams have a 500-meter range, roughly twice the distance of light-emitting diode high beams. Lasers are also energy efficient but expensive. The Sport Quattro concept hints at Audi's continuing interest in lasers. At the 2011 Frankfurt auto show, Audi unveiled an A2 concept car with rear fog lights powered by laser diodes. Audi did not indicate its production plans for laser headlamps, but the company noted that its 2014 R18 E-tron Quattro race car will have them. Laser diodes are part of an array of energy-saving devices that BMW has incorporated into its i8 model. Lasers are smaller, brighter and more energy efficient than LED headlamps. According to BMW, the i8's laser headlamps use less than half the energy of LEDs. In the BMW i8's headlamp, three small diodes generate blue laser beams when electricity passes through the diodes. The blue beams are aimed at small mirrors, which reflect them onto a lens. Inside the lens is yellow phosphorus, which emits an intense white light when activated by the lasers. That light is bounced off a reflector onto the road ahead. So what is visible is the white light emitted from the lens, not laser beams. According to BMW, a laser diode can emit 170 lumens per watt, while LEDs generate only 100 lumens. A lumen is a unit of visible light. BMW has not identified its laser supplier, but Osram Opto Semiconductors Inc., a major producer of LED lighting, has invested heavily in laser technology. Sevugan Nagappan, Osram's marketing manager for infrared and laser products, declined to indicate whether his company will supply laser diodes to BMW. But Nagappan said laser technology is more than an exotic technological toy. "There is definitely interest outside BMW for using laser diodes," Nagappan said. "People are looking into it. They want to figure out whether it makes sense or not." But lasers are sensitive to heat and are expensive. Neither problem appears to be a showstopper. Engineers can design heat sinks to dissipate a laser diode's excess heat, Nagappan says. Laser prices should decline as production volume increases. And that could happen as manufacturers start using laser diodes in overhead projectors used in conference rooms. "There is a huge market for these units," Nagappan said. "We expect that projector sales will take off in the near future." While Nagappan is optimistic about the prospects for lasers, it's unclear whether they have a decisive advantage over LEDs, which have proved well-suited for tail lamps, turn signals and daytime running lights. As prices have declined, LEDs have proved well-suited for headlamps, too. In September, Audi unveiled its redesigned A8 sedan, which featured an adjustable high beam generated by an array of 25 LEDs. Given the versatility of LEDs, it's unclear how quickly BMW's competitors will adopt laser technology. The Audi Sport Quattro concept suggests that lasers and LEDs might coexist. The concept's high beams are laser-powered, but the low beams feature a matrix of LED diodes. While lasers have received a lot of recent attention, it is too early to write off LEDs, which have amply demonstrated their versatility. Osram, a leading manufacturer of LEDs -- and a supplier to BMW and Audi -- feels no need to choose sides in this technology dispute. "Laser technology is not mature compared with LEDs, which have been around for decades," Nagappan said. "I don't think the battle between lasers and LEDs has been decided."